In today’s connected and evolving world, businesses need to be available to their customers 24/7. 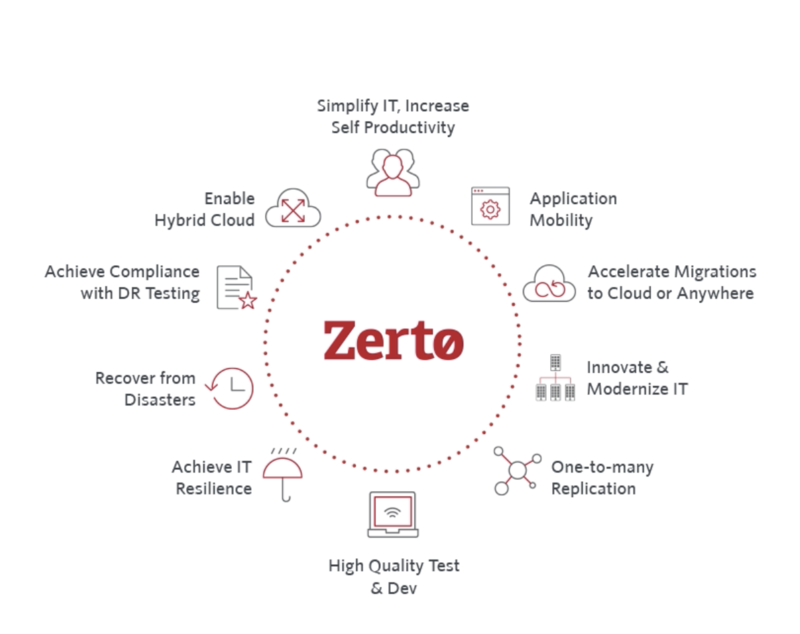 Zerto’s Virtual Replication solutions move beyond backup and recovery to IT resilience – providing businesses with the ability to withstand any disruption, easily incorporate new technology, and keep the business running uninterrupted. Maintain resiliency as infrastructure evolves. Protect, recover, mobilize and test critical production workloads. Rewind and recover individual files, folders, VMs, application stacks or entire sites. Ensure minimal data loss, minimizing the impact of disruptions. Enable true hybrid cloud flexibility. ZVR 5.5 is the only future-proof, all in one replication and recovery solution – making disaster recovery simple and scalable across private, public and hybrid clouds. With Zerto Mobile, you can securely monitor protection across multiple sites anytime, anywhere on mobile, tablet or web. What else is possible in ZVR 5.5? ZVR offers burstable performance, Scalability, and regional coverage of Microsoft azure. Just failover before the surge, enable reverse replication and get your workloads back on prim ounce the burst has settled. With Zerto’s Virtual Replication 5.5 you’ll be able to realize the true and full potential of hybrid clouds with all the flexibility and security you’re used to having in your on-premises environment. Contact Clear Technologies today to discover the future of IT resilience.